Red Beet Salad with Cranberry Maple Vinaigrette - Our Sunday Cafe, the Retirement Edition! Each time I see another flooded bog, I know the cranberry harvest continues. Which usually reminds me how much I love them and that thought sends me to the kitchen to enjoy the creative process of recipe development. With autumn here and the holidays looming (in a good way!) this salad was a natural to put together, and the taste, let me tell you it is wonderful. Maple, beet, and feta might seem like a mismatched trio, but in truth, they play very well together. A good rule of thumb regarding fresh beet salads is that the smaller and fresher the beets, the better the salad. Save the larger beets for winter over storage and cooking. Combine the dried cranberries and water, bring to a boil, reduce heat and simmer until most of the water has evaporated. Cover and remove from heat, let cool. 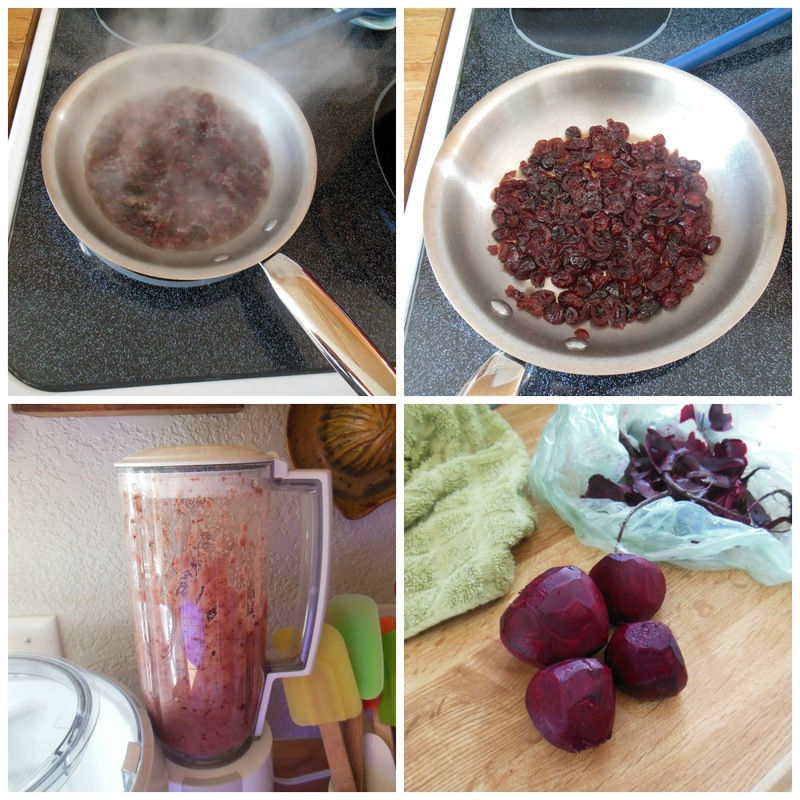 Start to finish, simmered cranberries, vinaigrette in the making and beets ready to shred. Combine the cooked and cooled cranberries, vinegar, oil, salt and pepper, and maple syrup. Puree in a blender. Set aside. Peel and shred beets, Add dressing to the beets, stir well. Cover and refrigerate at least 2-4 hours. When ready to serve the salad, core and dice the apple, (do not peel). Toss with the beets and cranberry vinaigrette. Fresh beet salad, ready to serve and enjoy. Arrange on a platter, scatter the feta over the top. I was scanning all the photos at the blog hop and I was immediately drawn to yours. This salad is so colorful and unique. It would be such a pretty addition to a holiday meal. Yum! I love this time of year because cranberries are my favorite. This says FALL to me. Michelle, thank you for your comment, the salad is quite good and very pretty. Diane, we are in the middle of cranberry harvest on the peninsula, that has been inspired me to cook up some cranberry recipes. So far I have only used dry, but I hope to get some organic fresh berries soon. What a delightful salad for this time of year especially. I don't believe I've ever had uncooked beets, but will have to give this a try. Perhaps with young beets. thank you for the recipe. I adore beets and love beet salad. I'm not a beet lover, but with the other ingredients, which I do like, it might be a good recipe to try. Thanks so much for sharing this very special salad with us, I can't wait to try it! Have a great week and hope to see you at Full Plate Thursday again real soon!